The New Republic GR-75 Gallofree Medium transport "Rim Runner" sits in Orbit above the jungle world of Varonat an Outer Rim planet near Endor on the Corellian Trade Spine. It's mission: ferry Republic Personel and military equipment off the forest moon of Endor and deliver them to Sullust. 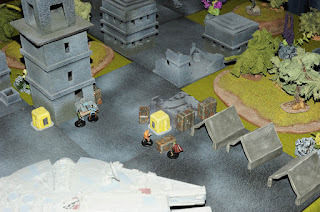 It is to rendezvous with two Y-wing starfighters from Gold Squadron at this location. The Escorts are well overdue. "Lieutenant Arkel scan the area for anything unusual." The Sullustian Captian Muldo Mul paced back and forth across the bridge with his arms crossed. This was suppose to be a safe rendezvous point for their missions but he suspected something had gone wrong. "Sir I'm picking up some wreckage near the rendezvous point. I can't identify it but it is enough to be a couple of starfighters". Lieutenant Sune' Arkel was an Zabrak pilot and technician. She had only been serving aboard the Rim Runner for a few months. The only other individual on the bridge was the navigator Darin-Une a Cerean who had only been aboard a few months longer than that herself. This was to be the transport and crews last mission for the New Republic due to cutbacks made after the signing of the Galactic Concordance a few months ago. Captain Mul rubbed his chin "I don't like this.... sound action stations we want to be ready..". Suddenly the entire ship rocked from a loud explosion. "Sir we've got four TIE fighters and two TIE bombers! They came out of nowhere!" Arkel spun around in her chair to face the captain just as another heavy concussion missile hit the ship. Two more impacted seconds after that "Abandon Ship! Get to the escape pods!" shouted Mul and then his control panel exploded. A large arc of electricity shot out of it and hit the Sullsutian square in the chest hurling him against a bulk head. Darin-Une rushed over to check on the Captain but there wasn't anything she could do. The two Republic crew members scrambled into the bridge escape pod and blasted away from the ship. As they looked out the view port they could see TIE fighters chasing down other escape pods and blowing them up. It was clear these renegade Imperials were not interested in prisoners. 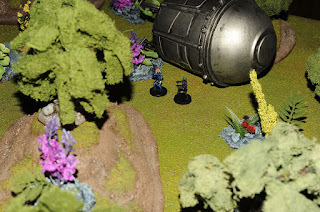 The escape pod crashed through the jungle canopy and made a fairly soft landing on the jungle floor. Unfortunately for the two survivors the distress beacon was destroyed in the crash. "Probably just as well. Would have alerted the Imps to our location anyway." Arkel sighed. Darin-Une checked the pods short range commutations system I'm picking up a bunch of what sound like encoded Imperial transmissions from several locations on the planet as well as some other strange transmission about 10 kilometers North" she said. "Well strange is better than Imperial. We should check it out." The two gathered supplies and weapons from their escape pod. Fortunately for them the bridge escape pod was equipped with a better selection of weapons and equipment than the standard ship pods. In addition to blaster pistols and survival packs there were also armored flight suits and a break down sporting blaster rifle stored aboard. Not wanting to stick around until the Imperials found them they set out for the source of the strange transmissions. Trekking through the jungle was tough but Sune' was a Zabrak and was used to living in harsh conditions. She was impressed by how well her companion was keeping up. Of course they both had received basic survival training during their service. They had managed to avoid several rough areas and a few dangerous examples of flora and fauna. Then she noticed the ground she was standing on was shifting slightly. 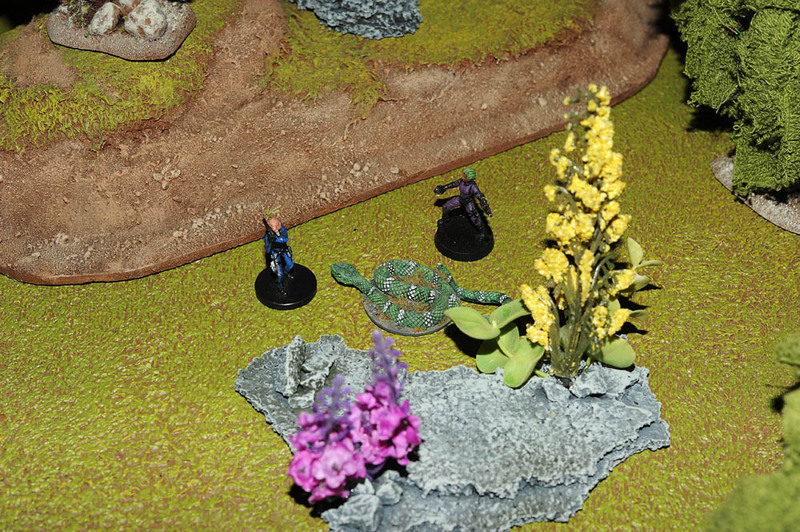 "Look out it's a..." the massive serpent lifted it's head and opened it's mouth lunging at Darin-Une. She jumped back drawing her blaster pistol and shot it right between it's eyes dropping it instantly. "That was close" the Cerean said. 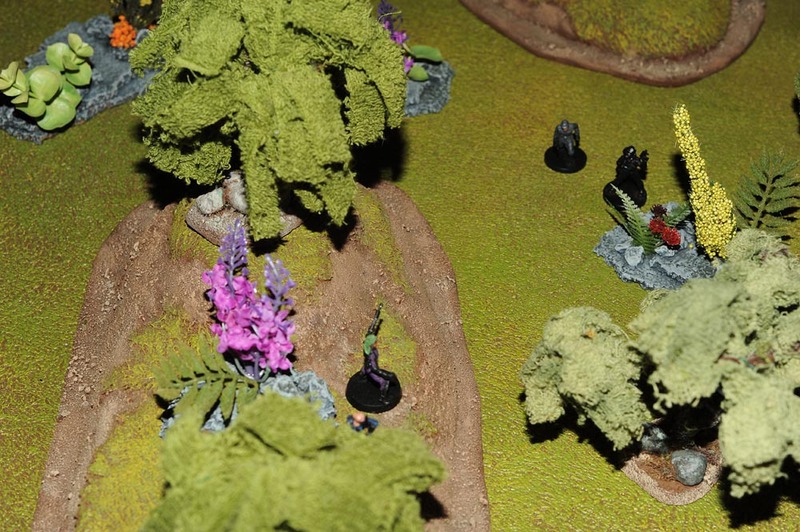 They continued through the jungle being a little more cautious than they had been. It was getting towards mid day when they heard "Where the heck are they we've been searching for hours!". The voice was human sounding but filtered through some kind of helmets comm system. "Keep your voice down! We know one of the pods came down in this location." another more normal sounding voice replied. Peaking over the hill they saw a pair of armed humans. One was dressed in an Imperial officers uniform and another was wearing the black flight suit and helmet of a TIE fighter pilot. Darin-Une and Sune' Arkel drew their blaster pistols and shot as the two men. The pilot was hit and took a step back but the officer returned fire. Suddenly two more attackers began firing at them. They appeared to be Storm Troopers of some kind. The Republic officers traded fire with the Imperials. The TIE pilot went down first followed by the officer. Sune' was hit by one of the Storm Troopers and went down grabbing her side. Darin-Une traded more fire with the troopers eventually taking them both out. The Cerean then check on her companion. Sune' was unconscious and she had a nasty blaster wound in her lower torso but she was alive. Darin-Une pulled the med-kit out of her survival pack and went to work. After patching the Zabrak up she woke her and gave her a shot of stimulant. "Sorry I had to wake you. We can't stick around here" she said. "Where are the Imps" replied the Zabrak. "Dead, I think" Darin pointed and the bodies of the Imperials. "Well lets see if they have anything useful" replied Sune'. The gathered a pair of blaster carbines and utility belts from the dead Imperials. "That's odd this one seems to be equipped for cold weather" Darin said pointing at one of the Storm Troopers. "Well I've heard rumors of renegade Imperial raiders operating out here in the Outer Rim. I guess they have to make due with whatever equipment they have on hand" replied the Zabrak. They continued on at a much slower pace through the jungle. Sune' was having a hard time keeping up due to her wound. Eventually they came across some ruins where they noticed a small encampment and a well maintained YT-1300. "Looks like Pirates to me" said Sune'. "We need that ship" replied Darin. "Hey we've got a couple thermal detonators on these utility belts. I've got an idea" said Darin. They carefully moved over to a building about 50 meters from the ship and set the detonator to go off after several minutes. They then took up a position on an over grown hill near the camp. There were two pirates paroling the ruins around the camp and four hanging out at the camp. The detonator exploded blowing the ruined building to pieces. One of the pirates patrolling through the ruins was hit and killed by flying rubble. Two of the pirates scrambled out of the camp towards the explosion but two remained. One ran to the com station "We are under attack! 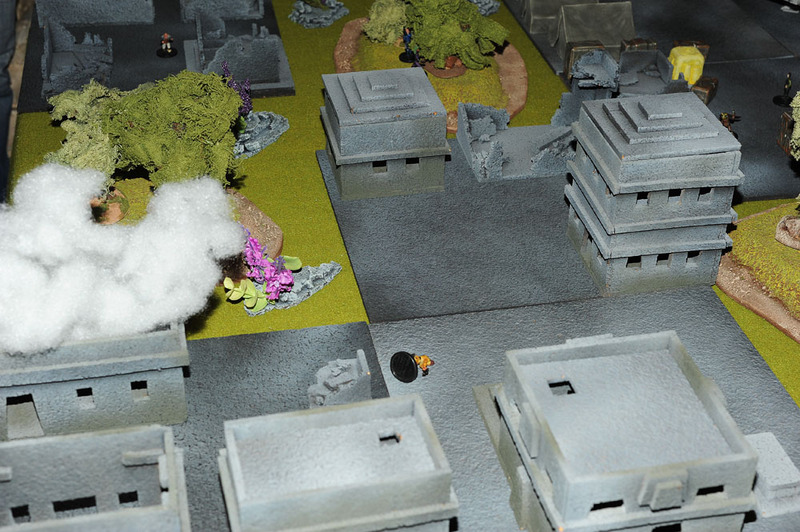 All units return to base" the pirate shouted into the com. 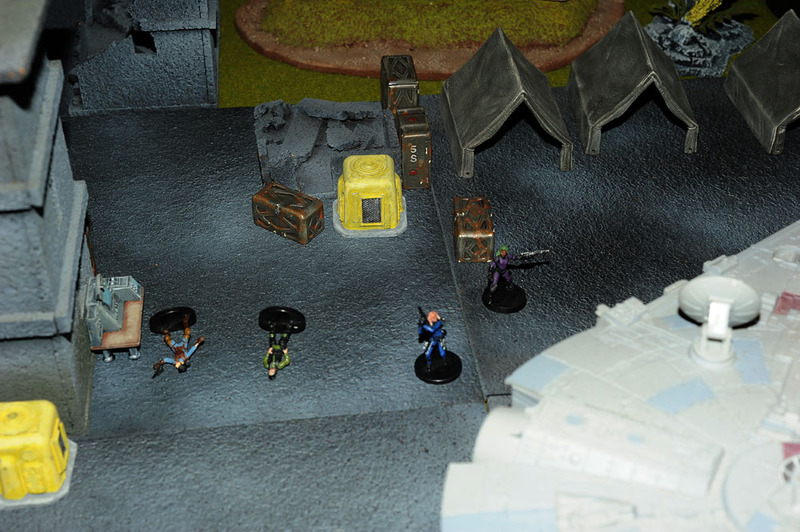 The Republic officers took out the pirates with stun blast and ran to the YT-1300. The boarding ramp was down so they ran on board and and went strait to the cockpit after securing the ramp. Within moments they blasted off heading for space. The remaining pirates took shots at them with their blasters but the armored hull of the freighter protected it from harm. As they got into space an alarm on the ships panel went off. 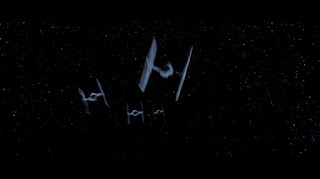 "Four TIE fighters heading our way. We need to get out of here! Check the nav computer to see if anything is programmed in" shouted Sune'. "Yeah, I've got something! How about Corellia?" replied the Cerean. "Punch it!" Sune' shouted. The freighter jumped into hyperspace well before the TIE fighters could get in range. It took four days to reach the core world of Corellia. In that time Sune' Arkel was able to heal from here wounds with the help of Darin. As they came out of hyperspace Darin was piloting and she laid in a course for the Corellian space station to make arrangements to land. Before she reached the station the YT was intercepted by a pair of X-wing starfighters. The freighters com system activated "Attention YT-100 285-0691 you are hereby ordered to proceed directly to docking bay 74 in Coronet City by the Corellian Security Force. If you attempt to flee or power up your weapons you will be shot down. Will you comply?". "Yes sir..." Darin replied. After landing in docking bay 74 Darin and Sune' decided to leave their weapons on the ship. 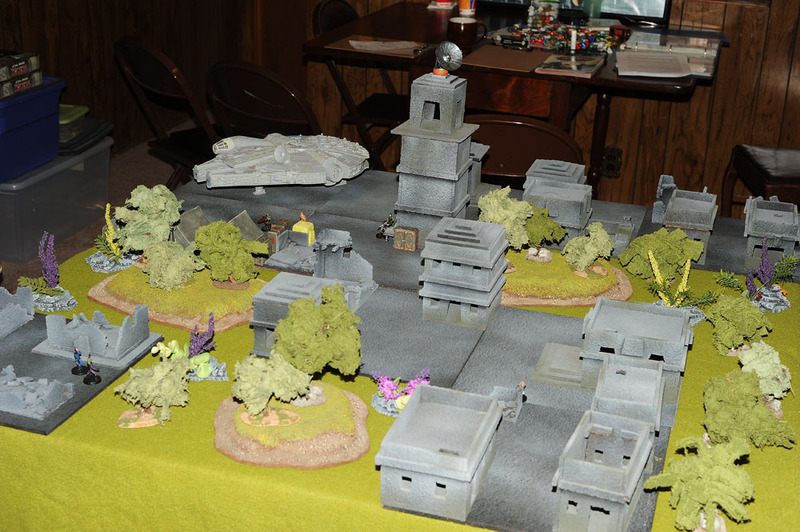 Outside they were met by a dozen armed and armored troopers and a CorSec officer. "This ship was reported stolen two months ago by a Corellian citizen. You are under arrest on the charge of piracy. Come with us." The two were taken into custody and booked into a nearby security station. After spending a few hours in holding they were taken to questioning where they were questioned. They gave their story to the detectives. Four days later they were released by CorSec and given a reward for returning the YT-1300 by the ships owner. Then they were told to stop by at the Republic Fleet office where they received their official discharge and hazard pay. Now unemployed they decided to search for work together. Notes: This was an introductory adventure I ran for my new Star Wars campaign "Shards of the Empire". The campaign is set a little more than a year after the battle of Endor and will follow the new story arc set by "The Force Awakens". The events in the campaign start 30 years before the events in the movie before the rise of the First Order and the formation of the Resistance. I am using the Savage World system but I will also be using Fantasy Flights X-wing for space encounters. Tonight I only had two players show up so I did character creation and ran a short introductory episode. Looks to be a fun campaign, and with little published for the period, it does not feel very hemmed in at all. I have thought about setting something on Tatooine myself, "tourists" coming to look at/spit on the birthplace of vader.